U.S. marketers spent 221% more on programmatic display advertising in Q2 2014 compared to Q2 2013, according to new research from digital marketing tech provider IgnitionOne. Additionally, the number of impressions has risen 163% compared to a year ago, while clicks (146%) and conversions (132%) have also more than doubled. The fact that the increase in spend outstripped rises in impressions, clicks and conversions shows that marketers are willing to spend more per impression when buying via programmatic. Advertising via the Facebook Exchange (FBX) has taken off on IgnitionOne’s platform, with 42% of all display impressions being bought on the platform being from FBX. IgnitionOne is an FBX preferred marketing developer. However, that statistic should be digested with a grain of salt, as it isn’t representative of the industry at large. Turn, one of the largest demand-side platforms (DSP), told Real-Time Daily that FBX accounted for 14% of all display ad impressions served over the last 30 days. But on IgnitionOne’s platform, advertisers are flocking to FBX, which the company believes is a result of cheap, effective ads. Despite accounting for 42% of all programmatic display impressions bought via IgnitionOne, FBX accounted for just 18% of the spend. 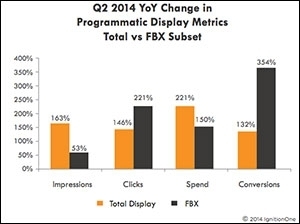 The company also claims that 66% of the clicks and 36% of all display conversions it saw came from FBX ads.